It seems to me, in fact, that there is no-one else in rock doing anything remotely like what Shearwater are doing except for my one great musical obsession, Peter Hammill. This isn’t a comparison I make lightly, but it’s one that makes sense to me given Meiburg’s sharp intelligence, rich voice and gifted way with words, not to mention the grand ambition of his songwriting. In other words I find this music completely spellbinding, from Meiburg’s soaring vocals via his remarkable texts to the way the songs ebb and flow from peak to challenging peak. Shaped by gorgeous melodic touches, the songs speak eloquently of memory, violence and the precarious relationship between human and natural worlds. 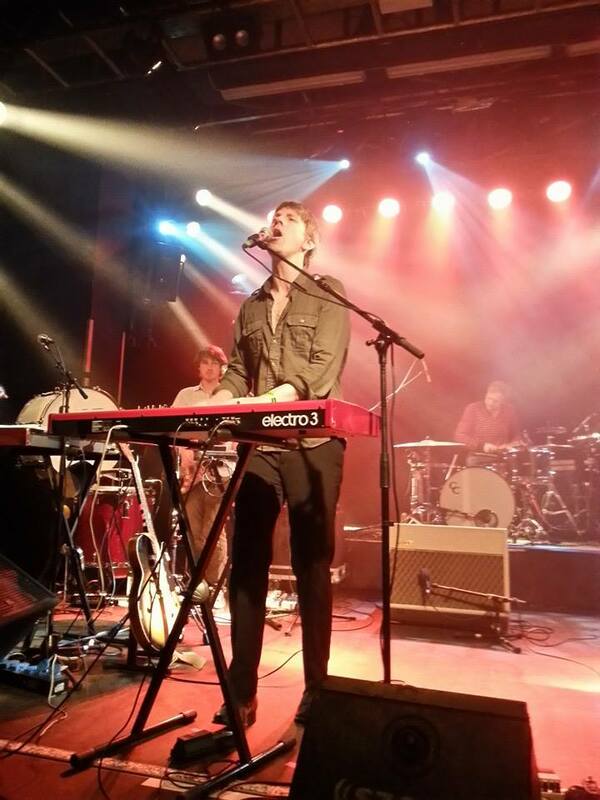 Live, Shearwater are a fearsomely powerful outfit, with Meiburg’s up-front guitar and keyboards bolstered by energetic percussion and, well, more guitar and keyboards. Between songs he is witty, relaxed, yet always riveting. His spoken introduction to the song “Home Life”, in which he tells of looking out of his bedroom window as a boy and seeing the lights of radio towers in the distance, is both evocative and strangely moving. After an enthralling main set, Meiburg returns to the stage alone for a stark solo reading of the anguished “Hail Mary”, slashing furiously at his guitar as his voice echoes around the hushed room. Finally the group send us home with an exuberant cover of Roxy Music’s “Virginia Plain”, a fun way to end the evening for sure but one that feels almost too lightweight in comparison to the epic scale of what has gone before. The last time Neil Young came to Vienna was six years ago, touring on the back of the Chrome Dreams II album. That show, in the slightly odd surroundings of the Austria Center (which has rarely been used for rock concerts since; maybe they were put off by the fact that the audience nearly broke the floor with their jumping up and down) was a relatively user-friendly affair, with an acoustic set followed by an electric set and a fairly generous helping of Young’s greatest hits. Wednesday night’s concert, on the other hand, was definitely one for the diehards, with extended jams aplenty and an acoustic set that lasted for only two songs – one of which, “Blowin’ in the Wind”, added up to not much more than glorified busking. And yet this was the one that played out in front of a capacity audience in the soulless barn that is the Stadthalle, with its muddy acoustics, concession stands and endless parade of people wandering around the place. All of which goes to show, as if it needed reiterating, that nothing is predictable in the world of Neil Young. The other big difference between the 2008 and 2014 concerts, of course, was that this time Young had brought his legendary backing band Crazy Horse with him. And while there’s clearly no “right” or “best” way to see Young, given the plethora of styles and configurations at which he excels, there’s no denying the crackle of excitement that greeted his entrance onstage accompanied by rhythm guitarist Frank Sampedro, drummer Ralph Molina and substitute bassist Rick Rosas, along with two excellent female backing singers. On the other hand, if there’s one thing Neil Young has been at pains to communicate in his almost 50-year career, it’s that love is not all you need. The strongest emotion emanating from the stage was not love but anger – and righteous anger at that, borne of an abiding and passionate humanitarian conscience. The singer’s black hat stayed stubbornly on his head for almost the entire evening, but from my vantage point fairly close to the stage (or, if you must, from the video screens on either side), it was clear that his mouth was set in a more or less permanent snarl. It was as though these long (14 cuts in two hours), serpentine songs, their distorted shapes hewn from volume and electricity, were the only possible response to an ongoing crisis of global proportions. That response was inscribed not only in the more hard-rocking numbers like “Love to Burn” and the inevitable main-set closer “Rockin’ in the Free World”, but also in the more elegiac moments such as “Living with War” and “Cortez the Killer”. “Cortez” in particular was exquisite, with Young drawing out long, achingly tender cadences to frame the song’s narrative of love and sacrifice. When not at the mic Young was most often to be found squaring up to Sampedro, the two men seemingly oblivious to all but the music binding them together, a touching image of two sexagenarians holding fast in the storm. Given the depth of Young’s back catalogue, there will always be gripes about the setlist, with regrets over omitted songs an inevitable aspect of any post-gig discussion. In my case, the absence of “Like a Hurricane”, “Hey Hey My My”, “Powderfinger” and “Cinnamon Girl” was particularly keenly felt. It was also unfortunate, though perfectly understandable, that Young chose to round off the evening with the bouncy but rather cheesy new song “Who’s Gonna Stand Up And Save The Earth?” But such disappointments count for little when weighed against the urgency and vitality that Neil Young, at 68, still brings to everything he does.